Garides Saganaki is an appetizer made with shrimps and tomato sauce. Saganaki takes its name from a frying pan with two handles called “sagani”. The most popular way of making this appetizer is with ouzo. I was not going to post this recipe today but some time after Easter, as I wanted to focus on strictly Lenten recipes. Those who read my blog regularly know that I have been fasting since Clean Monday that is since 2nd March and I have been posting only nistisima, which are vegetarian and vegan recipes, as during lent no animal or products derived from animals such as eggs and dairy products, are allowed to be eaten. The only thing allowed is seafood and on two Sundays, the 25th March andd on Palm Sunday, fish. During Lent, on Sundays, I either make octopus, kalamari or shrimps and on the other days, I usually cook vegetables or dried legumes. This recipe was made on the morning of my birthday on the 29th March. That morning it was a lovely spring, sunny Sunday and we enjoyed our lunch outside on the balcony accompanied by some ouzo. The dish finishes with the addition of feta so as I was the only one fasting, before adding the feta I took some out for myself and added some feta for the rest of the family, who are not strictly fasting. Apart from this dish, I also made some Bourekia with Mushrooms, a Greek salad and with some crusty bread, it was a very filling meal. I cook more than three different recipes daily so it is impossible for me to post all the recipes I make as early as I would like to. I have more than 100 unpublished recipes some dating more than a year back and whenever the occasion arises I publish whatever I think suitable. I have made this recipe more than once. When I was hosting the Think Spice event, I made a thorough research about mastic and it was then that I saw mastic liqueur used in saganaki, so I had that in mind when making the recipe. Those recipes did not have any of the ingredients I added but I made the usual saganaki which is usually in a tomato sauce and feta making my own twist by adding mushrooms, peppers and fresh herbs. It was as simple as that. This morning when I visited a Greek blogger, I saw a certain similarity to my recipe and just said that I had made a similar recipe. He started sending me e-mails, surprised that I could think of something he has also thought of, as if he had made the discovery of the century. I replied to his questions and I even sent him a copy of my recipe as well as the above picture. He insinuated that I made everything up and was warned not to post the recipe as I would make a fool of myself to claim that I made a similar recipe since he published it first and copyrighted it. I am sure that the Greek bloggers have understood to whom I am referring to, as they have had a similar experience with him in the past. He chose not to publish my comment. The conclusions are yours. Heat the olive oil in a non-stick frying pan and sauté the onion and the garlic until translucent. Add the shrimps and sauté for a few minutes. Season with salt and pepper and add the liqueur and mix for a minute until the alcohol evaporates. Add the mushrooms, peppers, fresh herbs parsley, oregano and thyme and sauté for five minutes. Add the tomato and keep mixing about 15 minutes until all the liquids evaporate and it remains only with the sauce. (The dish finishes here as a Lenten dish). Add the feta and stir for a few minutes. This dish can be also served without the feta for a Lenten (nistisimo) dish. This looks delicious. I am sorry about the other blogger being such an accuser and bully – it’s sad that people like that are everywhere, even amongst bloggers, who are generally so friendly. I am glad you posted the recipe! That dish looks mighty good! Surely very flavorful and definitely heavenly! I’d love to sit at your table to share a meal with you ;-P! Ivy, first of all the dish is wonderful, I too have an appreciation of Mastixa and I also recently made a Lenten dish with shrimp and Mastixa. Mine is different from yours and I don’t think you or anyone else has thought to be the genius to think up such a combination. You’re perfectly just in posting your dish, I believe you (as I’m sure others were). The facts will play out very shortly. 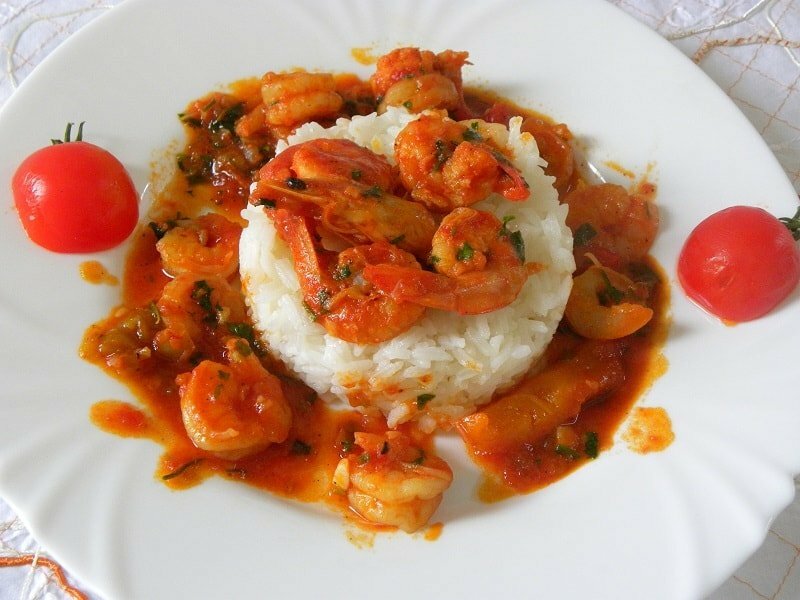 Me and my hubby absolutely love shrimp,like you succulent flavorful saganaki. And similar recipe posts coincide very often in the blog sphere,it really silly to think one has copied from other.I’m also glad you posted your recipe. I’m sorry also that you had to deal with this man. Your recipe is wonderful!! Oh Ivy, I am not a Greek Blogger but unfortunately know exactly who you are talking about. I love how you dealt with this issue. True class and tact!!! Sorry he has gotten you too. Love the recipe!!! This looks devine Ivy – yum! Yum! shrimp and mushrooms, this looks delicious. Ciao ! Ivy Thank you for your nice message ! I love your dish it must have been so good suitable for your birthday !! I love how beautiful are the Bourekia ! Ivy, I think this shrimp saganaki with Masticha is wonderful. To think, that a woman like yourself , who lives in Greece can even think of such a dish. I thought all Greek dishes were created by “you know who”…I heard he has copyright over them!…lol! I hope you like my sarcasm and I will be emailing you! Ivy, I’m sorry you had to go through this … I have been behind on blogging lately and just got to read this post of yours. How awful for people to actually have the nerve, the gall, to assert they created dishes. And to even take it a step further and essentially “harass” you about it. I feel sorry for this person as he has nothing better to do with his time. As for your dish–I would much rather dive into a large platter of your own version of shrimp saganaki me mastiha along with a big “fratzola” of bread for dipping. it’s disgusting to hear that you have been intimidated by emails and warned not to post what you created and wrote about. i congratulate you on your courage to beat down bullies. Just returned on a trip from Greece and loved your recipe, tried it tonight and it was so good. Want to know if you also have a recipe for Tomato Fritters or tomato keftethes? Have seen different recipes but not quite certain which to use. Would appreciate it if you could email me a recipe if you have it. Hello, I have been reading your blog for a while, and I am amazed at your cooking stamina, your creativity and your experimentation with Greek recipes. This Sunday we had a dinner to honor my father, and among other things I made garides saganaki to serve to our guests. Before posting my recipe, I decided to take a look on the internet, to see what other bloggers did with this recipe. I read your post, read about the controversy with this Greek blogger, and decided that you should remove all masticha from your house! Ha, Ha, just kidding! How come that I, relatively new to blogging, knew exacty whom you were refering to? He makes that kind of impression. I never thought of using masticha with shrimp, but masticha is part of our heritage, and I am glad it’s being used in all these various ways. I am facinated by the combination of shrimp and masticha, and I will have to try it. Thank you Ivy for your beautiful posts. Hi Ana. Welcome and it's wonderful to meet you. Thanks for your lovely comment. I have forgortten about this controversy as I've stopped communicating with this person ever since. At the beginning of blogging I wanted to record my traditional recipes, and as the time passes, I think that I have proven my creativity in hundreds of recipes and practically 99% of my recipes are my own creations.